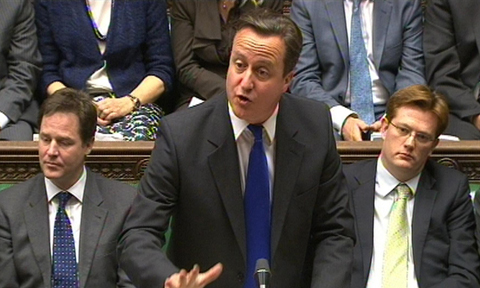 At Prime Minister's Questions David Cameron said "The reason people are going on strike is because they object to the reforms we are making to public sector pensions, but I believe those reforms are absolutely essential,"
The Prime Minister added: "What I would say above all to people on strike today is that they are going on strike at a time when negotiations are still under way." Ed Miliband, the Leader of the Labour Party asked Cameron: "Why do you think so many decent, hard-working public sector workers, many of whom have never been on strike before, feel the Government simply isn't listening?" The Prime Minister then branded Mr Miliband "irresponsible, left-wing and weak" for backing industrial action, and insisted: "I do not welcome these strikes one bit." Problems are being reported on Gatwick Express train services, although it appears to have nothing to do with the strike. The normal15-minute service has now been reduced to a half-hourly one due to a signalling problem in South Croydon. All other Gatwick services currently running well. The PM's spokesman has confirmed that "a handful" of staff at 10 Downing Street have joined today's strike action. The spokesman also confirmed that a "small number" of Downing Street staff have volunteered to help out manning the borders today, though they are not thought to include any prominent figures. Others have been affected by strikes at their children's schools, said the spokesman. Another update from our reporter Kevin Rawlinson: "Large crowd gathering at Lincoln's Inn Fields. Getting ready for the London march, which will leave from there and head south to the Thames, before turning west and marching to Westminster. We're due to set off at 1pm." Reports are coming through that around 50 people have been arrested in Dalston. 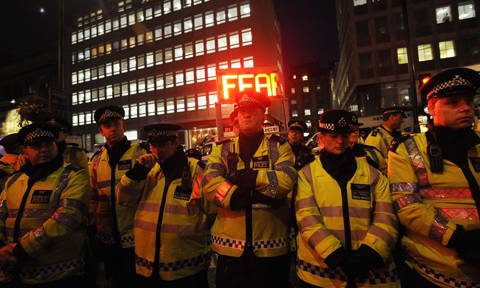 The Dalston arrests are thought to have occurred around the CLR James Library. A spokesman for East Sussex Healthcare NHS Trust said "no planned operations have been cancelled" and a "minimal amount of appointments have been affected". The House of Commons chamber is operating as normal, but many facilities across the estate have been affected. Five canteens, bars and restaurants have been closed, including the Jubilee cafe that is usually open to the public. The Strangers' bar, reserved for MPs and their guests, remains open. Undercover police in the Panton Street kettle appear to have left. Our source in the crowd says at least 5 were hounded out. They're not too subtle, he was told. Our source inside the Panton House kettle has been told that police are taking details, including addresses, from the trickle of people being released. Xstrata - the company whose HQ was targeted by the Panthon House protesters have released a statement. A spokeswoman for the company said: "All executive pay is approved by the company's shareholders and is linked to company and individual performance. Last year Xstrata delivered its second best financial performance since inception, with an 86% increase in profits, record cost savings, improved safety performance and total shareholder returns substantially greater than the FTSE 100 average." 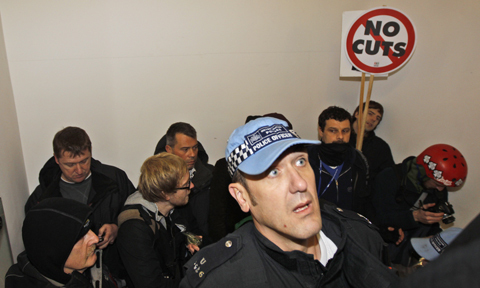 Earlier Occupy London issued a statement identifying Xstrata CEO Mick Davies as the target of the protest. They said "he was the highest compensated CEO of all the FTSE 100 companies in the last year, when his companies had losses and the economy collapsed. He received £18,426,105 for his efforts."